Chancellor, Vice-Chancellor, honoured guests and graduands, it gives me great pleasure to be presenting today Colin Treadaway-Hoare, for the award of Honorary Doctor of the University. Colin has led a remarkable life. He is an entomologist and one of the world’s leading experts on butterflies of the Philippines. He has dedicated his life to exploring the world and discovering new species. Born in Hampshire in 1923, Colin developed an early interest in butterflies and moths which was stimulated from his first catch when he was six years of age. He has since discovered and named over 400 species and sub-species and has collected over a million scientific specimens, now deposited in the Senckenberg Research Institute in Germany and the Natural History Museum in London. Colin, now in his 90s, has achieved all of this as a ‘hobby’ and still maintains a passionate interest in the subject. Colin left England for Canada during the Second World War and spent time in the Royal Canadian Air Force. He graduated from McGill University in Montreal with an honours degree in Chemical Engineering in 1951 and began working for Procter & Gamble in Cincinnati, USA. In 1953, he was posted to Manila and it was there that he became actively involved in entomology, focusing specifically on Philippine lepidoptera. Colin’s career with Procter & Gamble saw him travel widely to many different locations including Venezuela, Indonesia, Peru and Morocco. In 1978 he was appointed Manufacturing Director of Procter & Gamble GmbH, the company’s German subsidiary. At this time Colin began publishing work with the help of scholars in the field of lepidoptera and to date has produced more than 100 publications. In 1981, he was appointed an honorary member of the Senckenberg Research Institute in Germany. Colin retired from Procter & Gamble in 1987 and become even more deeply involved in the study of Philippine lepidoptera. In association with the Senckenberg Institute, he made research trips almost every year to the Philippines, camping for weeks in jungles. He has many fascinating stories to tell of his adventures during this time. Some were quite challenging, involving encounters with pirates and guerrilla groups (including communists, Islamist extremists, and the notorious ‘Huks’), as well as a variety of jungle animals including giant snakes and chimpanzees and monkeys. Colin negotiated them all with his natural charm and diplomacy (and a little bit of luck) and succeeded in amassing an incredibly important collection for future study. Latterly, Colin has spent time writing and publishing scholarly works and has been keen to pass on his immense knowledge to the younger generation. He has worked as a consultant in his field to museums and universities around the world. Colin recently moved to Derby to live with his daughter and has become a friend to the University. This year we were very fortunate to welcome him to share his great knowledge and experience of working on butterfly taxonomy with our staff and students in the School of Environmental Sciences. 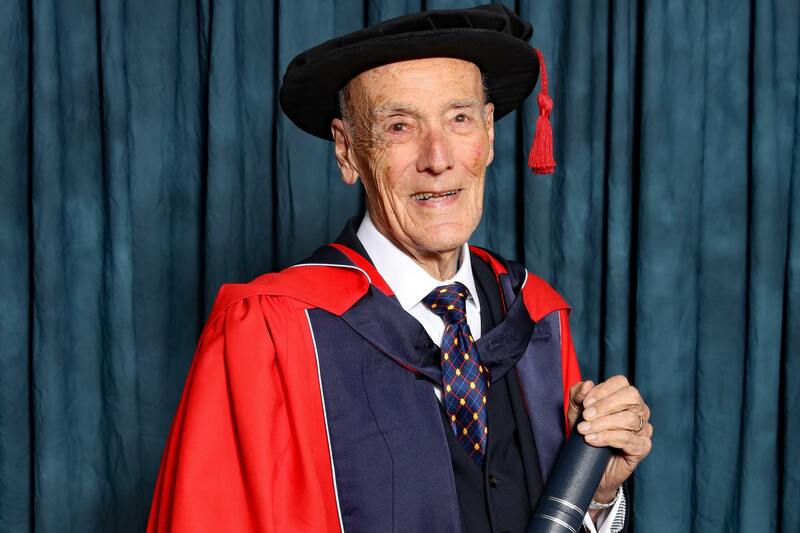 Chancellor, in recognition of his significant contribution to butterfly research, we are delighted to award Colin Treadaway-Hoare the honorary degree of Doctor of the University.